Today we celebrate the life of Nelson Mandela. As he, himself, stressed frequently, the transformation of South Africa from a regime of apartheid to democracy was never the work of one man alone. Yet Mandela was the great catalyst for change. His ‘long walk to freedom’, perseverance, endless compassion and extraordinary charisma, inspired generations of people to seek and fight for change. He was a leader in its purest and most spiritual sense, by fighting not for victory over oppression but for equality and understanding between all sides. He will be remembered alongside Gandhi and Luther King as one of the great peacebuilders of history. And as we approach Christmas and the festive season, let’s take a moment to reflect on the process of peacebuilding. Peacebuilding is a process which has been adopted and widely promoted by the United Nations and other international organisations. “Peacebuilding” is different from “peacemaking” and “peacekeeping” in that it focuses on creating a long-term culture of peace, rather than solving individual conflicts. Peacebuilding activities aim at building understanding and tolerance between individuals, communities and societies and establishing new structures of cooperation. Activities range from individual acts of kindness, to community initiatives that cross cultural, political and religious boundaries, right the way through to inter-governmental programmes between nations. Create Inner Peace & Harmony – without ‘inner’ peace within ourselves how can we possibly move towards ‘outer’ peace with others? Creating and maintaining balance and harmony in ourselves and being ‘at peace’ with ourselves is necessary through reflection, contemplation and personal forgiveness and the inner harmony that is achieved will be reflected in the actions we take in dealing with others. Create an affirmation and repeat it often, such as: “When my mind, body and soul are in harmony, I am at one with the Universe,” engaging the help of the angels of peace and harmony. Communicate & Cooperate – no agreement can ever be achieved unless dialogue takes place. Being able to discuss issues, cooperate with others and move towards understanding is at the foundation of creating peace. Sometimes it can be difficult to enter into dialogue, especially with those who have hurt us, but it is essential to open channels of communication and to keep them open. Create an affirmation for your communication such as: “I connect with the oneness of all creation as I communicate from the heart”Working with the angels will help your communication skills by helping you to deepen your understanding of others. Respect & Understand Others – as children we are brought up to believe in ‘rights’ and ‘wrongs’. But this black and white view of the world does not exist in reality. In every person there are elements of good and bad. To create peace between people, within communities and ultimately between nations, it is necessary to respect the notion that other people can have different views and beliefs from ours and that this is OK. Mutual respect for others is not a sign of failure or capitulation, but rather a willingness to try and see the good in others and understand how they feel. It takes strength and will power to stand back and let go of the need to impose our ‘better’ ways on others. An affirmation might be: “I am at one with all my family, and with all of humanity, who are my brothers and sisters” All of us are part of the vast network of energy that connects humanity to the rest of the universe. Be Compassionate & Forgiving – to err is to be human, and to forgive people their transgressions is one of the common tenets in every religion and faith. Forgiveness and reconciliation are, perhaps, the hardest part of creating peace, because it requires not only putting the pain and hurt to one side (ideally forgotten permanently) but often there will be the need for you to admit your own failings too. Once again, reconciliation does not mean that you have given up your own ideals, or given in to your opponent’s. It is a process where both parties agree that they will put differences aside and begin afresh the process of peacebuilding. Affirmations for these virtues could be: “I completely forgive myself and others” or “I treat everyone I meet with love and kindness”. By holding on to bitterness we are only harming ourselves as we now know that it is our thoughts that cause disease of the body. Offer Protection & Justice – for peace to exist people need to feel safe and secure and so if you protect those in your care and offer fair and impartial judgement when there is conflict, you create an environment in which others can begin their own steps towards peace. By conducting your life in a confident manner, shining your inner light as brightly as you, can you automatically empower others to do the same. Affirmation: “I seek justice and fairness in all my dealings with others.” Archangels Zadkiel and Michael will help you with these two issues, call upon them whenever you are faced with an issue of justice and protection. 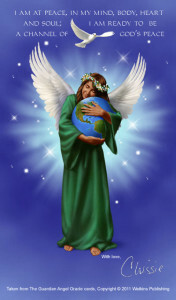 Uriel, remember, will help you to strengthen your ‘back-bone’ and resolve. These principles can be applied at every level – from creating harmony between individuals in your home or workplace, to peacebuilding across societies and nations. How can you apply these principles into a daily spiritual practice and take positive actions to create greater peace in your life?